Sales of new homes increased 27% in March, the biggest monthly increase in 47 years. The sharp jump was largely due to the fact that the first-time home buyer credit program is going to expire on April 30. 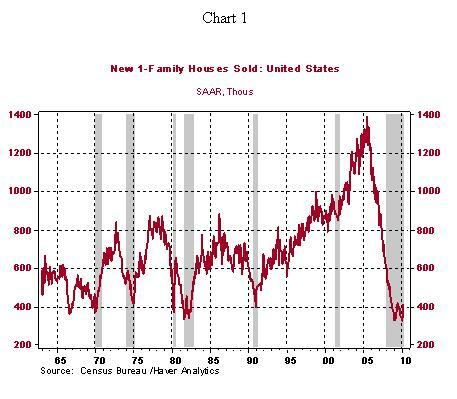 As seen in the chart below (graph courtesy of Northern Trust), the level of new home sales in March (411,000) still remains slightly below the July 2009 mark, or 70% below the peak recorded in July 2005. Also watch this video interview of Mark Zandi, Chief Economist at Moody’s Economy.com, on the housing market outlook. It’s been a while to have Tom Ashbrook’ On Point on this blog. This Hour, On Point: how the U.S. looks from rising China. Jia Cheng, a 28-year-old graduate student at Harvard Business School. She has moved back and forth between the two cultures as a businesswoman working for both McKinsey & Co. and Goldman Sachs. She grew up in Shanghai and graduated from Fudan University.